Send the flower girl in wagon down the aisle as a creative wedding ceremony addition. This child's toy is a perfect way to add a touch of whimsy to your ceremony processional. The wagon may not be the first idea that occurs when you think about wedding props for your flower girl. After all, most girls only carry a basket of petals. However, it can be a wonderful addition to your wedding if you put it to work throughout the wedding itself. For example, a wagon is a wonderful idea for a summer wedding theme, and you can incorporate wagons on invitations or favors. Additionally, the wagon solves a few issues and provides the photographer with some great props. The wagon is perfect for pulling infants down the aisle who are too young to walk. With a little padding and a back support, youngsters can be propped up to sitting position for the ride down the aisle. Create a miniature bassinet by decorating a basket and putting it inside the wagon for newborns. Having children in the bridal party can be tricky, as even older kids may be too nervous to walk down the aisle alone. Nip this problem in the bud by having the flower girl ride in the wagon down the aisle (with or without the ring bearer). All she has to do is drop petals over the side of the wagon. 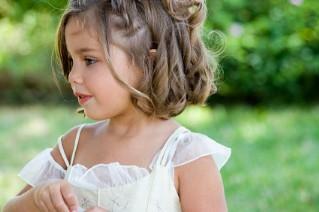 By turning the processional into a fun activity, you can calm the flower girl's fears. Put the flower girl(s) into the wagon for a few fun shots with a professional photographer. The bride could be pulling the flower girl, or, if the flower girl is older, a crazy wedding picture of the flower girl pulling the bride in the wagon. The wagon is also perfect for use in traditional posed portraits of the bridal party, especially if you are planning a backyard wedding. Place the flower girl in wagon in the front of the group, or have several wagons with multiple girls flanking the bridesmaids. Capture a few shots of the ring bearer with the flower girl in the wagon, too. Have him pull the flower girl(s) or pose him sitting inside the wagon with the other child(ren). Using a wagon as the processional transportation for a flower girl does require some forethought. The first thing to consider is whether the ceremony location is suitable for a wagon. A wagon will fit nicely into a garden wedding, but at an indoor religious ceremony the wagon may not be permitted. Find out if you need to put down a special aisle runner or liner before pulling the wagon in an indoor processional. Secondly, unless you want to purchase a special wagon for the ceremony, you need to use your own or borrow someone else's wagon. Wagons are usually an outdoor toy, so it will require some cleaning before it is suitable. Decorate the outside to cover any logos and to make it fit into the wedding decorations, but be sure the decorations will not get tangled in the wheels. Thirdly, if the flower girl is in the wagon, you need to figure out a way to get her down the aisle. Accomplish this by having a junior bridesmaid or the maid of honor pull the wagon. Older ring bearers or older flower girls may also pull the wagon down the aisle. Finally, consider what to do with the wagon once the flower girl reaches the end of the aisle. Babies and toddlers likely will not stay inside the wagon, so reserve a seat towards the front for their parents and push the wagon off to the side. Tuck a few books or magnetic puzzles in the wagon for preschool-aged flower girls to amuse them while they are at the front of the guests. This allows them to stay up front without making them stand for the entire ceremony. Older flower girls can simply exit the wagon and stand with the rest of the bridal party. A wagon can get the flower girl down the aisle effortlessly, and it is a quirky prop that adds a little pizzazz to an outdoor or indoor ceremony.